She really could. She could kick a lot of people's asses—not just yours. That's because Amanda Lucas is a mixed martial arts superstar. Lucas began MMA in 2008 after taking Brazilian jiu-jitsu classes. The former dance instructor's first fight was in May of that year. "I got beat up pretty bad," Lucas told Sports Illustrated. "I didn't know what I thought I knew." Lucas lost that first bout in 2008. But Lucas didn't give up, and she returned to the ring the following year and posted her first win. "Honestly," said Lucas, "I would want to know early on in my career what it's like to be beat down and have to come back." Last year, she started fighting in Japan, where women's MMA has a substantial following, posting two more fights. This past Valentine's Day, she racked up another Japanese win, and her career record now stands at 4-1. "Japanese fans are fanatical about Star Wars. I get it and I appreciate it," the 30-year-old Amanda said. "I'm very proud of my family and my father's accomplishments. It's just about finding that good balance." 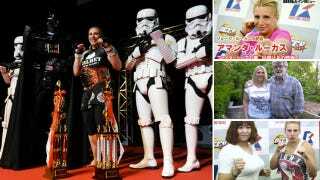 Before a fight last fall, one Japanese promoter used the Star Wars theme for her entrance music—something she specifically made a request against. In her most recent fight, she did walk out with Stormtroopers and Darth Vader. It apparently was part of a promotion for the 3D Star Wars films. Don't get the wrong idea, though. She won the bout. And while Lucas has appeared in bit roles in her father's Star Wars films, she hasn't coasted on her father's name—and certainly cannot in a MMA ring, where the only thing that matters is how you fight, not what your dad does.